Space shuttle Endeavour stands at Launch Pad 39A near the Atlantic seashore at NASA's Kennedy Space Center in Florida. 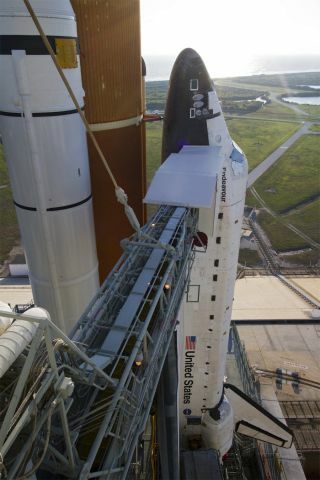 The shuttle is slated to launch on its final mission, STS-134. This story was updated at 4:46 p.m. ET. NASA's space shuttle Endeavour is ready to launch on its final voyage April 29, top mission managers decided today (April 19). Shuttle officials approved the launch plan after a day-long meeting called the Flight Readiness Review (FRR), which allowed mission managers to discuss Endeavour's mission plan in detail and consider any possible issues that might delay liftoff. "The team was unanimous and we're ready to go fly," NASA's associate administrator for space operations, Bill Gerstenmaier, said during a press conference following the meeting. Endeavour is slated to carry six astronauts, a cargo bay full of spare supplies, and a $2 billion astrophysics experiment to the International Space Station. "The potential science that it can return to understand the dark matter that lives in the universe and understand these unique high-energy particles that are out there in space, it's going to be tremendously important," Gerstenmaier said. "This is a pretty unique mission to close out Endeavour's career." Space shuttle Endeavour's STS-134 crew members pose for a group photo on the Shuttle Landing Facility at NASA's Kennedy Space Center in Florida after arriving on March 29, 2011 to begin final launch training ahead of an April 19 liftoff. Kelly has spoken of his hope that Giffords will be able to attend the launch in person from Florida, despite the fact that she is still undergoing rehabilitation at a Texas hospital to recover after being shot in the head outside a Tucson grocery store in January. Endeavour's STS-134 mission will include four jam-packed spacewalks to install the spare parts and upgrade the orbiting laboratory. Currently, the trip is scheduled to last 14 days, but NASA has the option to extend the mission by up to two extra days to fit in more work if necessary. "We'll probably add those two days, taking that to a 16-day mission, but we won't do that until we get on orbit and see what we've got," said Mike Moses, NASA's shuttle program launch integration manager. "All in all it's going to be a very busy mission, very packed." Endeavour's upcoming voyage is the second-to-last space shuttle launch planned before NASA retires its 30-year-old shuttle fleet. After the mission, Endeavour will be sent to the California Science Center for public display. Its sister orbiters, Discovery and Atlantis, will be retired at other museums. The final space shuttle mission, the STS-135 flight of Atlantis, is targeted for June 28.